Light-Up your room and add your own personal touch with this set of Led Photo Clip String Lights.Each photo-clip contains an LED that emits a colorful light,a fun addition to any space.Battery operated,each set includes a small battery box for easy installation anywhere without having to worry about your display being near an outlet or power source. A perfect Lighting Decoration for living room,studies,dormitories,galleries and etc. Suitable for halloween,birthday,party,chrismas and other events decor. TRY AmazingPlace TODAY! Remember...If you're unhappy with our products in any way, we'll completely refund your purchase. No questions asked.Our products are trusted by many customers. Our focus on Superior Quality means Superior Performance that you can count on when it matters. 10 clear photo-clips of each set.Each clip contains an LED that emits warm white light. Require 2*AA batteries to operate (not include),each set includes a small battery box with ON/OFF button. Two modes: flashing/ steady on;low power consumption with a long service time,safe and reliable. Micro but useful,portable string light in your hands with infinite possibilities. 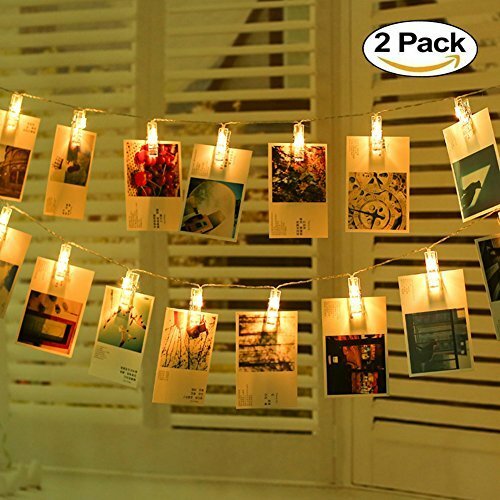 Package includes:2*10 LED photo clip lights. If you have any questions about this product by AmazingPlace, contact us by completing and submitting the form below. If you are looking for a specif part number, please include it with your message.